Health Supplement to fight urinary infections and bacteria in the gut. Several clinical studies have shown cranberries to be useful in helping the body overcome urinary tract infections caused by bacteria, which adhere to the lining of the bladder. Evidence suggests that certain constituents in cranberries can interfere with this adherence, thereby helping the body fight off infection and also reducing the likelihood of an infection occurring. However, cranberry juice is very sharp to the taste and consequently many commercial cranberry drinks are laden with sugar and high in calories. Lamberts® Cranberry Complex is produced from fresh mature cranberries which are first washed and de-pectinised to remove unwanted substances. The juice is then dehydrated at low temperature then pressure and spray dried to produce a low sugar concentrate. This ensures the unique properties of cranberries may be enjoyed by those following sugar-restricted diets. Approximately 25 grams of fresh cranberries are used to produce just 1 gram of our concentrate. As a result, just one teaspoon of our concentrated cranberry powder is equivalent to up to 12 typical cranberry tablets sold in many high street shops. 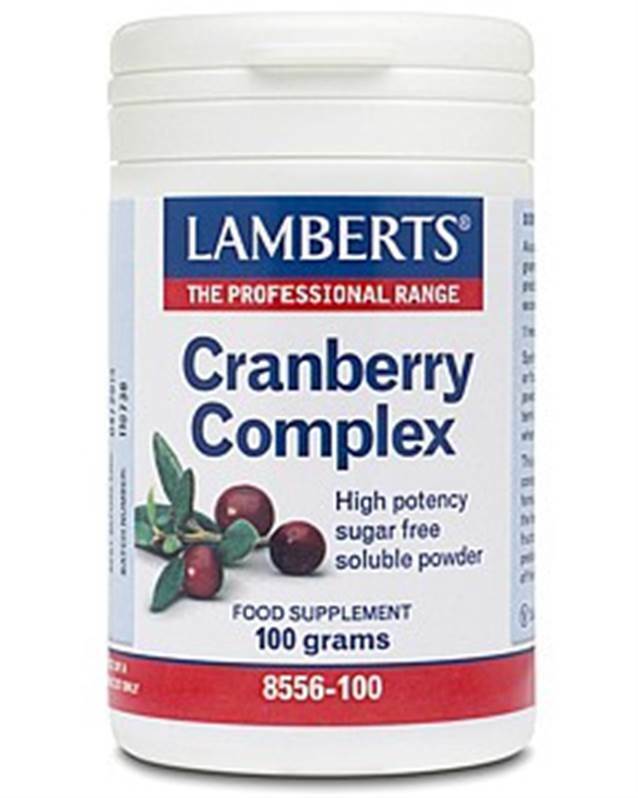 Lamberts® Cranberry Complex also contains useful levels of a soluble fibre called fructo-oligosaccharide (FOS), a sweet, easily dissolved substance extracted from chicory root. FOS acts as a prebiotic, which means it encourages the growth of friendly bacteria, which help to suppress pathogenic, troublesome bacteria. Cranberry juice concentrate powder Fructo-Oligosaccharides and vitamin C.
5 to 10 grams daily. 5 grams is equivalent to one teaspoon. Sprinkle the powder into cold water or fruit juice and mix thoroughly. The powder may be taken safely on a long term basis used intermittently as and when desired.